This is our medium Specialized Turbo Levo Hard Tail 29 Electric bike for hire. If you’re looking for a bike that’s going to propel you down the trail at top speed, then look no further than the Turbo Levo Hardtail 29. What could possibly make a fun, efficient and speedy 29er even better That’s right, Turbo technology. This is a bike built to take your trail riding up a gear, without exerting all that extra effort. Our hardtail trail bikes are renowned for their super-speed and ability to turn on a sixpence and the Levo Hardtail 29 is no different. 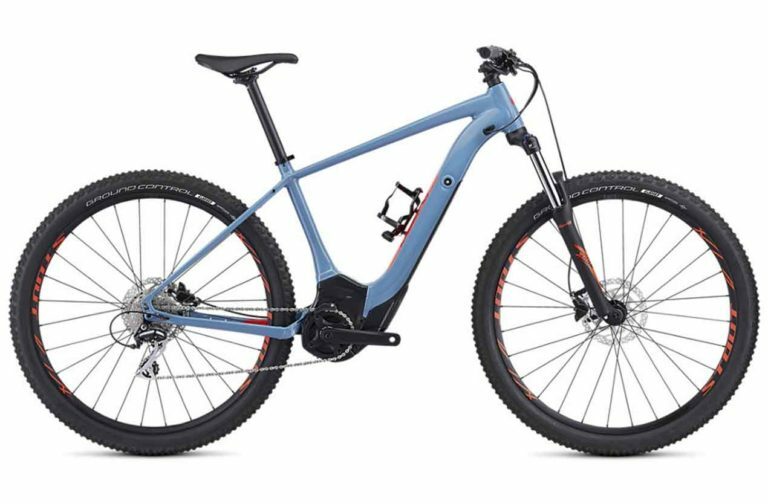 It features a roomy top tube for an easier fit, super-short chain stays to increase handling, and a low bottom bracket that sticks you to the trail below. These trail-blazing features are paired with incredibly efficient and powerful Specialized e-bike technology, as well as a durable and lightweight M5 Premium aluminium frame. Our redesigned 1.2E motor features instant pedal engagement, allowing an instantaneous delivery of power, as well as consistent torque across the entire range of different cadences. The motor is optimised with the addition of an Rx Trail-tune which helps it to run smoothly and quietly, while also delivering mean, adjustable levels of power. Our M1-400 battery powers the Rx Trail-tuned motor and integrates with the down tube to give the bike a flush and uncluttered appearance, as well as allowing easy access for quick charging between rides. The battery has enough juice for the longer days in the saddle and communicates with the integrated Trail Display up top, using the Mission Control App, to give you full control of the bike’s tech. Hitting the sweet spot between lasting durability and sublime performances, the Turbo Levo Hardtail 29 is equipped with an SR Suntour XCM32 fork with size-specific travel up front, trusty Shimano hydraulic disc brakes and a one-by Shimano groupset that takes care of all the shifting, seamlessly. The M5 Premium aluminium frame benefits from our unique Trail 6Fattie Geometry to give the bike the slack handling and super-speed associated with 29ers. Both the motor and the battery sit flush within the frame, giving the bike an extremely streamlined aesthetic, as well as perfect weight distribution for maintaining balance while out on the trail. Internal cable routing keeps up the clean, streamlined look with an alloy dropper post topping off the expertly constructed frameset. Our 1.2E motor has been fully optimised for trail riding with the addition of an Rx Tune. It intuitively reacts to the force of your pedalling to deliver just the right amount of power. The motor is belt driven, keeping vibrations low for the smoothest and most silent ride possible. The M1-400 battery communicates directly with the Trail Display and ANT+/BluetoothÂ® module through our unique Mission Control App. With 400Wh of power to throw onto the trail, this battery is perfectly suited for those longer days in the saddle.